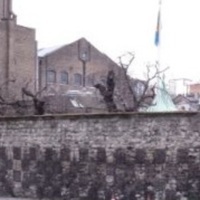 This photo captures the original fourteenth century wall at the center of the frame and monastic gate at the far left. The wall was constructed out of flint and part of its eastern front was knocked down to make room for the Tudor era mansion's eastern side. The arm of St. John Houghton, the last prior of the Charterhouse and first Carthusian martyr, was nailed to the gatehouse after he and two other monks were hanged, drawn, and quartered on May 4, 1535 for resisting against the Act of Supremacy. Note: the location of the gate and wall relative to the entire medieval monastery is denoted by the area within the yellow oval in the "Map of Charterhouse in Medieval London." Photo by Joe O'Brien, “Charterhouse (in 2015),” Medieval London, accessed April 22, 2019, http://medievallondon.ace.fordham.edu/items/show/188.